A $40,000 Global Grant enables us to impact -2,000 university students per year-$20 each…. 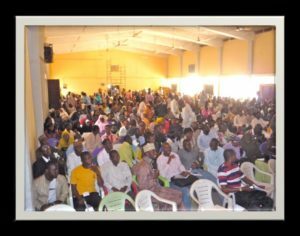 11,000 University Students in Nigeria have been taught to write Business Plans by a Team of 4 from SGV. Nigerian-American Sarah Philips, Rancho-Cucamonga Rotary, is our point person. Formerly Chief Legislative Officer of Kaduna State. She gets things done! You can send a person to participate on this team, then take responsibility elsewhere next year, maybe in a land of heritage. We’ll teach you. Projects completed in Armenia, Lebanon, Israel (Nazareth), Uganda, Zambia, Mexico, American Indians –Underway in Nigeria, Mexico (Corazon) & Tanzania (next)…. For a $30,000 Grant we need $10,000 matching -how about 10 Clubs X $1,000 to get another project in place?…..Can your club support? A survey in Sweden of youth 10 years after a high school JA Company class showed that 23%, or about 1 in 5, had actually formed a business. But each new business also hired on average 4 employees -thus 5 jobs were created. For every 100 youth that were taught entrepreneurship, 100 jobs resulted! Pursue Job Creation in your community’s schools as well as Internationally. American Indian youth also offer great opportunities. Recruit a leader and team. Involve Rotaractors and Interactors. Publicize widely that Rotary is pushing to Create JOBS for New Generations. Recruit new Members to participate. Business Savvy Rotarians can make a difference in creating jobs and more importantly‘Entrepreneurs’.